The last of the lettuce was harvested this week... if only there was room for more. My small garden has quickly outgrown itself and I long for more space to plant great quantities. It was my hope to keep the lettuce going in rotation but, alas, the second planting of carrots and green beans have occupied the remains of available soil. I'm looking to spring for additional beds and ... yippee... more veggies! 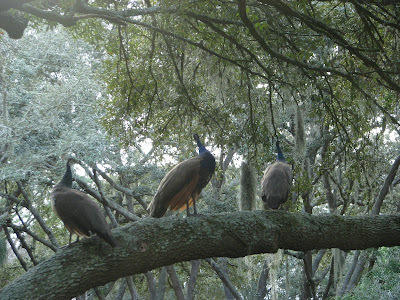 This time the peacocks caught my attention from indoors when I noticed out of the corner of my vision their large figures lifting up to the branches in my front oak trees. First one and then, one by one, four of them (only three pictured) landing on the low-lying cross branch that extends out over the front lawn. I took the photo through the front window trying not to startle them. As soon as I walked outside they extended their wings to float to the ground and strutted off across the street to my neighbor's garden. There, all six of them joined forces to forage through her plants looking for bugs and small critters to eat. The neighborhood rumor is that someone on the next street over is keeping them on their back porch at night and letting them roam during the day. Not a good plan I surmise. They are big and they trample through the planting beds and they stick together as they forage. None of my neighbors are very thrilled about their presence. I really don't encourage them to be in my garden either. At the same time I'm praying they don't discover my veggie garden. I'm pretty sure it would not be a good thing if they did. Speaking of neighbors... my sweet widowed neighbor directly to the south has managed to keep his garden growing (for the most part) since his beloved wife passed away 2.5 years ago. 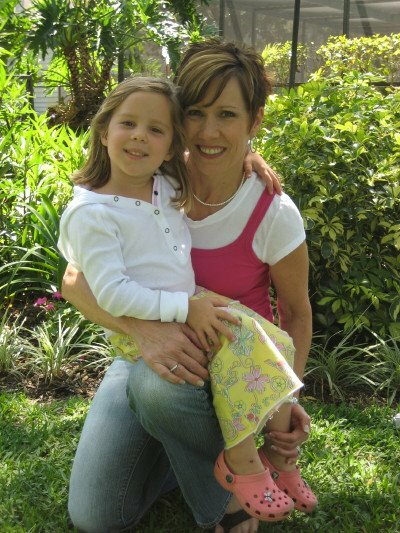 She was a dear gardening friend and I miss her so. Every year at Christmastime the paperwhites she planted many years ago and she dearly loved pop out of the ground and bloom into a small sea of white not far outside the view from my back porch. It is a calming reminder of the way a garden exudes life and continues on even in situations when the planter has moved on. Butterfly life in my garden is not nearly as abundant this time of year as in other seasons. Even so, there are quite a few that flitter about in the sunshine and warmth of our currently mild and temperate days. 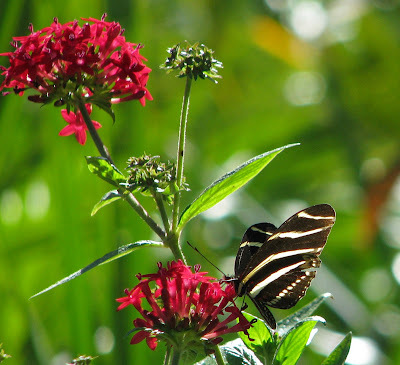 So happy was I to spot the zebra longwing from my kitchen window that I took time out to walk away from busy cooking preparations the day before Christmas to track this one down with my camera. This pretty narrow-winged creature has the softest wing flutter that can be distinguished easily from a distance. I've almost decided it is my favorite butterfly although the white peacock (not to be confused with the pea hens we featured earlier in this post) which can occasionally be seen here, too, is quite possibly tied for first love. Then there are the yellow sulphurs ... very prolific year round. They can be seen flitting about from place to place on any given sunny day. Somehow their rapidly fluttering ways and shyness to humans means capturing them on film remains my constant challenge. On the other hand, gulf fritillaries are much more cooperative. There aren't as many of them in winter but there are always a few entertaining and almost teasing me with their dancing routines as I toil about here and there in the garden. These are beautiful days to truly enjoy the fruits of all the labor of months past. The woodpeckers are everywhere chuck-chucking their gentle sounds and can be spotted a little more easily with the loss of leaves in some of the trees. Soft breezes and warm temps make just sitting in the garden (if one can stop the busyness) an absolute pleasure. Working in the garden is not restricted to 'early morning only' as in the heat of summer. It is quite an unusual time in that getting started in the garden even midday is not out of the question. This freedom of schedule in winter is a heavenly perk for a Florida gardener not imaginable most other seasons. Today, I have some passalong plants and cuttings to get into the ground. More on that in another post. I hope you are each enjoying the last days of 2008 and looking forward to what 2009 will hold for your garden. I was up late last night ordering heirloom seeds for the veggie garden. Are you getting exciting about what the new year will bring to your spring garden? I'd love to know I'm not alone in anticipation and vision for 2009! I'll be back later -- my son and husband are hungry! Wonderful post and yesmam I so am anticipating planting all of the wonderful seeds that I have received from garden friend bloggers. We have been busy getting ready. Ohhh I can almost feel the warmth of you region of the country. To still have lettuce and fresh green makes me envious of you living down south. Those peacocks are so funny, and beautiful! My hubby had a neighbor when he was a child who had peacocks. They used to roost in my father-in-laws carport rafters, of course pooping on the cars. That is until they were shot, lol don't mess with a man's car! Peacocks! I guess they would be a nuisance in garden, but what a great photo opportunity! Not something that most people would get to experience. I love your shots of the peacocks in the garden, how beautiful. I thought how perfect it would be to have them strolling around my garden, until I read your previous post about the damage they can do. Perhaps having them as temporary visitors is best. The pretty butterflies look like safer visitors. I cannot imagine have blooms and butterflies this time of year! The Musician and I were thinking about driving down to Florida in January, but we keep having sunny, warm days up here (without the flowers, though). Peacocks can get rather aggressive, much like geese. They are beautiful, but I understand the potential for destroying gardens. One of my uncles had peacocks that he kept in a high pen. I always loved getting the tail feathers that he collected. Ah, how I'm missing all the butterflies my butterfly bush drew to the front porch. That's the first thing I'm going to plant come spring. I'd have a hard time choosing between the zebra and the white peacock, as well. That first butterfly photo is just stunning! Now that Christmas is over I have had some time to look at my stack of seed catalogs and am happily planning my next garden. I once went to an open-air performance of Verdi's opera Tosca in Holland Park, which is a beautiful public park in west London. Every time the soprano started to sing, the peacocks decided that they would sing (or rather scream) along with her. It quite ruined the atmosphere of romance and tragedy, because it was difficult not to giggle. They are very annoying birds. You know I love the butterflies and they are a good sight to see today...now the peacocks are lovely, but I am glad they live in Florida! Almost Happy New Year Meems! You have inspired me and I am going to start an herb garden. Mr. Coach of course will help. :) By the way, the muffins were wonderful and will now be part of our Christmas traditions. Gosh Meems, what a wonderful stroll through your garden today despite the Peacocks. They are such huge creatures, I can't imagine that many in the garden at one time. What were those people thinking?? Of course I am thinking about what I want to do in the garden this summer. I am so far removed from summer that I can't do much about it though. Lovely photos. I recently became a member on the blotanical website and wandered over from there. I have a question on your Humble Beginnings - is 1984 the year you began gardening, or when you were born? Cameron, I know what you mean. When the boys are hungry the world must stop to tend to them. I do like the sunny, mild days... AND I like having flowers and lots of lush greenery. I haven't noticed aggressive behavior from the peacocks... right now they shy away from humans. Darla, I can tell you are biting at the bit to get your spring garden started. You've been smart to make all the preparations you can even before you plant. You will have to be patient a little longer than me since your threat of freeze is greater. It will be here before you know it. Kim, Thanks for your visit to Hoe & Shovel. I always know when the peacocks have been around even if I didn't SEE THEM. There poo is small dog sized... yuck. Robin, It is an opportunity I haven't quite captured like I'd like yet. I'm quite sure I'll have more chances since they are the "neighborhood peacocks." northern shade, every neighbor seems to be running them out of their yards. It's too bad there are so many of them... they can do damage pretty fast. The butterflies are my choice of visitor, too. Jan, I wonder if you leave your paperwhites in the ground all year long like we do down here??? Wishing you a very Happy New Year, too. Sophie, All the butterflies are sweet and such a treat to watch. But there are some that just have an extra-specialness... it's hard to narrow down which of them is a most favorite. They all love the butterfly bush... a good choice for closely observing. Connie, I think I read somewhere that peacocks and turkeys are in the same family. Is that possible? You are right. I can hardly buy those green beans the grocer sells in the produce section. Happy New Year to you and your family too. Victoria, That's a funny story. My neighbor across the street used to own a couple of peacocks. One would roost on the roof almost daily. It did seem like any time there was a loud noise in the neighborhood the peacock would almost compete by making its own loud noise.They are VERY loud. Someone on the other side of the creek owns peacocks that used to come onto our property nearly every day. They loved to eat our cat's dry food. Now that we feed our cats inside, we seldom see the peacocks on our property anymore. We do, however, still hear them quite often - their "cry" resembles a woman screaming. Very annoying. Gail, I sat on my back porch this morning doing the very same thing.So happy to relax with you today. I remember long ago every time I drove through a particular neighborhood I would have to stop for the peacocks because they were either in the street or trying to cross the street. Back then I could only think how magnificent and beautiful they were. I have to say, now that they have become somewhat of a nuisance, it takes away from the mystique of them a bit. Coach K, Perfect. Herbs are an easy starter plant. I can't believe I didn't have them for so long... now I can not be without them. Was out in the garden last night with a flash light cutting some for soup I was making. So happy to know the muffins worked for your family too. Lisa, It is kind of frustrating that someone is letting the peacocks loose on purpose. And yes, there are too many of them traveling together. It means their food requirement is large. sigh. Ahhh, Lisa, you just keep dreaming of spring... it is right around the corner and will be here before you know it. Patricia, I read that they do like dry cat food... its easy. I agree their cry sounds almost eerie. Actually I kind of like hearing it from a distance. Up close it is ear-piercing though. I so enjoyed your ramblings, Meems. Especially the butterflies. How wonderful to see them all year. 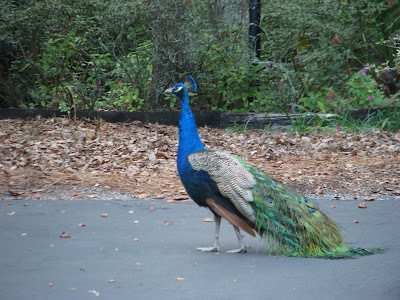 The peacocks are fascinating.I know they aren;t good to have a round gardens, but I would be thrilled to see such beauty walking around my neighborhood. Barely thinking of gardening yet. I have to get past the holidays before I am ready to strat planning. Hope 2009 brings you all good things. I wish you and your family a Happy, Healthy and Proserous 2009! Hi Meems, it is such a delight to read your soothing and vision inspiring words and see those same visions in your photos. Thanks so much for all that you give us. The thought of peacocks in the tree limbs is simply from another dimension! 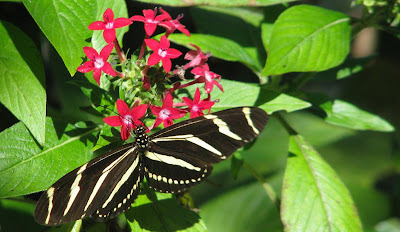 The fluttering of the butterflies slowly is also the stuff of dreams. I will keep that one for when I go to sleep tonight! May your 2009 be the best ever. I am ever so excited, as always, about what the garden will be like in the coming year. Seeds are started under a new light and heat mat in the greenhouse that should help with the success rate. Optimism abounds! Julian, Thanks for stopping by. Their call heard from a distance... once you know what it is... is very exotic as well. Tyra, Thank you so much and I wish you the very same. Frances, Gardening in an alternate universe... I think is what you call it... peacocks in the trees feels that way, too. Sadly, they are displaced too often these days with too much humanity taking up their wild lands. But that's for another discussion. A very happy New Year to you. Always a pleasure when you stop by Hoe and Shovel. Oh Meems! I just now popped in here to read your blog and look what I found! Peacocks! You will not believe this, but I posted about peacocks today! I didn't know you had done this post either. What are the chances of that, especially when I live where peacocks are not native? ?